When solving some technical problems may need to calculate the root of the third degree. Sometimes this number is also called the cubic root. The root of the third degree from this number calls a number, the cube (the third level) is equal to this. That is, if y is the root of the third degree in the number x must satisfy the condition: y?=x (x is equal to y cube). To calculate the root of the third degree, use the calculator. It is desirable that it was not a normal calculator, and the calculator used for engineering calculations. However, even with such a calculator, you will not find a special button to retrieve the root of the third degree. So use the function to raise a number to a power. The root of the third degree corresponds to the power of 1/3 (one third). To raise a number to the power 1/3 type on the keyboard of the calculator itself. Then press the "exponentiation". This button, depending on the type of calculator may look like xy (in Superscript). Since most calculators there is no possibility to work with conventional (non-decimal) fractions, instead of the number 1/3 type it the approximate value of 0.33. To obtain greater precision, it is necessary to increase the number of "triples", for example, to get 0,33333333333333. Then, click the "=". To calculate the root of the third degree on the computer, use the standard Windows calculator. The procedure is completely similar to that described in the previous paragraph instructions. The only difference is the name of the exponentiation. "Computer," the calculator, it looks like x^y. If the root of the third degree have to be considered systematically, use the program MS Excel. 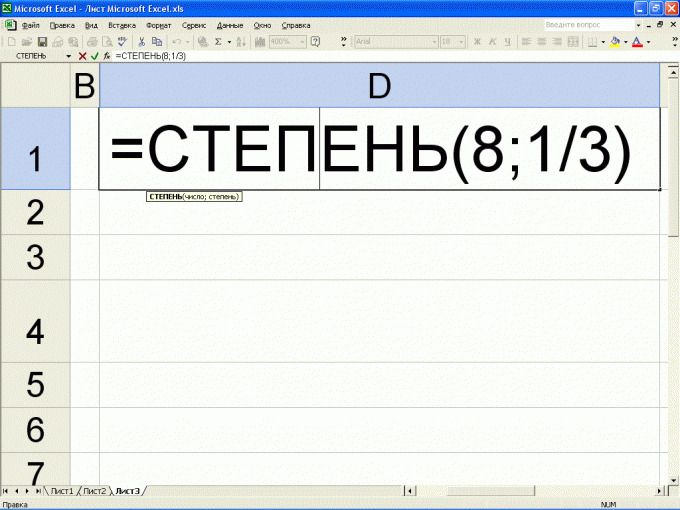 To calculate the root of a third degree "Excel", type in any cell " = " sign and then select the "fx" insert function. In the appeared window in the list, Select " select "DEGREE." Click "OK". In the newly appeared window enter the string "Number" value, from which to extract the root. In the line "Amount," enter the number "1/3" and click "OK". In the cell the table shows the value of the cubic root of the original number.